(310) 443-4277. (For postal mail, see bottom of this page.) Join her at www.drbarro.com hosted by The Authors Guild. Founder & CEO, barro global search, inc.: Email Dr. Arlene. Creator & Director, The Right Fit Program: Email Dr. Arlene. 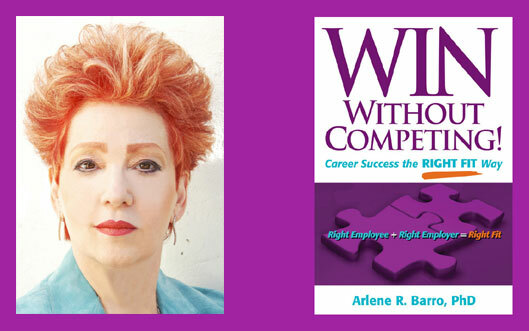 Talk Show Host, WIN Without Competing!, featured on BlogTalkRadio: Email Dr. Arlene. Administrator, Dr. Arlene's Club: Email Marissa Frykman. Literary Agent: Email Joelle Delbourgo, Joelle Delbourgo Associates, Inc. Speakers Bureau Representative: Email Jennifer Orell, American Entertainment International (AEI) Speakers Bureau, or call her at 617-782-3111 Ext.118. Visit Dr. Arlene's Speakers Page on AEI. Publisher: Email Kathleen Hughes, Capital Books.